Gold has time and again proven itself to be a safe haven. It makes sense to make it a part of the portfolio in spite of not-so-great returns. Indians love gold. The country is the worlds second-biggest buyer of the yellow metal and consumes 800-900 tonnes of it annually, as per the World Gold Council. In fact, one in every two households in India bought gold at least once over the last five years, as per the ICE 360 Survey 2017. Money Today examines whether it makes sense to add it to your portfolio in 2019. Is it Worth the Glitter? Though golds charm has eased due to a small price surge this festival season, globally, there has been a decline in prices. "There was a sharp decline in the US$ price over the quarter. But currency weakness in many markets meant that local consumers did not benefit from similar gold price reductions; instead, they were faced with steady - or even higher - prices," says a World Gold Council report. Gold prices in India are almost where they were five years ago - `30,265 per 10 grams in September 2013 and `30,620 per 10 grams in September 2018. But over the past 10 years, the metal has come a long way from `13,090 per 10 grams in September 2008, giving a 10-year annualised return of 9.21 per cent as against 10.74 per cent returns from equity and 7.73 per cent from debt as on November 30, 2018. But how will it perform in the future? The answers are hidden in the movement of the US dollar and crude oil, both of which are seeing the tide turn. Vijay Bhambwani, CEO of BSPLindia.com and author of A Trader's Guide to Indian Commodity Markets, says, "USA has piled on tremendous forex debt. Being the most indebted nation in the world, USA manages its debt partly by keeping the dollar strong. A strong dollar means weak gold and silver." However, he says the bullion is set to change its path in the next few years. "But Euro and Yuan have been giving the US dollar competition and non-USA settlements are bound to increase due to strong trade in the non-USA region. As a result, I foresee a re-calibration in the financial space, with more money flowing into bullion over the next three-four years," he says..
Higher inflation in the US could lead to a surge in gold prices. Rahul Jain, Head, Edelweiss Personal Wealth Advisory, says, "We are optimistic about the 2019 journey of gold due to inflationary circumstances building up. There is a strong sentiment that the Federal Reserve would increase rates and gold would be the biggest beneficiary. We see gold touching the `37,000 range by December 2019." More than a crucial investment avenue, gold should be looked at as a tool to spread risk and diversify. It is also a safe-haven during economic ups and downs, especially during phases of high inflation. "Returns from gold have been volatile in the short to medium term. However, over the long term, the performance has been stable. Investors should, however, look at the asset class as a diversifying tool, rather than a one-stop asset for investments," says Jiju Vidyadharan, Senior Director, CRISIL Research. Experts suggest an exposure of 5-10 per cent to gold. Balwant Jain, an independent tax and investment expert, says, "Gold helps you shield against inflation. But one should not invest more than 10 per cent of his or her portfolio in gold and that too for meeting social obligations." However, a few investment managers are asking investors to increase the share of gold in their portfolio going by the outlook for 2019. "While one should hold around 5 per cent in gold at any time, currently we are recommending investors to park 10 per cent in the metal," says Jain. Gold offers investors peace and safety of investment. But investment in physical gold has risks such as purity issues, chances of theft, price differential, and even making charges. There are also storage, locker and insurance costs. l Cross-check non-hallmarked pieces at Caratometers, which can be accessed for `50 per piece. l Check gold prices on www.gjf.in before heading to the store. Note that "selling rate" is the selling price for the jeweller and "buying rate" is the rate at which the jeweller will buy from you. l Rough cut bars called lagdis are available at a discount to bars that are minted, especially with special embossing. While you cannot adorn paper gold at weddings and functions, it outweighs physical gold in benefits, especially if one is looking at it as an investment. There are no purity and storage issues. A thief can't steal paper gold held in the form of Gold ETF, Gold Savings Fund or even the latest option of Sovereign Gold Bonds or SGBs. The prices are transparent. You can save on the mark-up of 2-15 per cent that jewellers charge on physical gold. For instance, on a day the Standard Gold Rate was Rs3,071 per gram, banks were charging Rs3,501-3,864, while a leading jeweller in Mumbai was asking for Rs3,732 per gram. On the other hand, a discount of Rs50 per gram was offered during the last SGB issue to retail investors paying online. "Investing in the asset class through the electronic route such as gold mutual funds/ETFs is better than the traditional way of hoarding it in the physical format," says Vidyadharan of CRISIL Research. Gold ETFs are like gold units held in demat form. Each unit of gold ETF represents one gram of 24K gold. 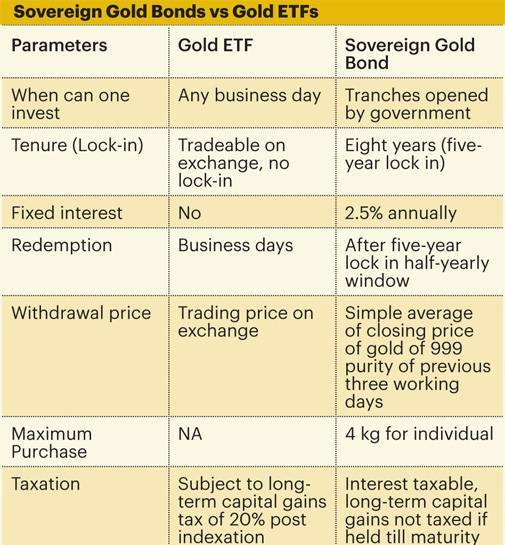 One needs a demat account to purchase gold ETFs, but that requirement is negated when one opts for Gold Savings Funds, which are basically investing in gold ETFs. The government introduced SGB, which offer an additional interest of 2.5 per cent per annum on the units purchased, to reduce the import of gold into the country and its impact on rupee. The tax implications differ based on the mode of investing. While physical gold attracts GST and capital gains tax, the gains from gold ETFs are subject to long-term capital gains tax of 20 per cent. Indexation (inflation adjustment) benefit is allowed if held for three years or more. GST does not apply on gold held in electronic form. Capital gains from selling SGBs have been exempted from tax if held till maturity. However, the interest on gold bonds is taxable. When bonds are transferred and capital gains tax arises, indexation benefits is provided. While gold ETFs and Gold Savings Schemes are available throughout the year for purchase and redemption, Sovereign Gold Bonds are issued during specific periods by the government. Tranches have been issued in April 2018 and every month from October 2018. The pattern is likely to be repeated. January 2019 (14th-18th) and February 2019 (4th-8th) issuances have been announced. Also, SGBs come with a five-year lock-in, so your investment in gold, if made for a specific purpose, should match the eight-year horizon or the five-year lock-in. If not held till maturity, one may have to sell on the exchange. Currently, the SGBMAR25 Bond is quoting at Rs2,802, a 14 per cent discount to the face value of Rs2,943. Sunil Subramaniam, MD and CEO at Sundaram Mutual Fund, says, "While sovereign gold bonds offer a fixed rate of interest, there is a lock-in. Often festive buying is linked to sentiment. Gold ETFs and gold savings funds are available for purchase and redemption on exchanges without any lock-in. ETFs offer better post-tax returns and are convenient compared to gold in other forms." However, if you transfer your gold bonds before maturity, you can get indexation benefit. Dhirendra Kumar, CEO of Value Research, says, "SGBs deliver higher returns than gold." 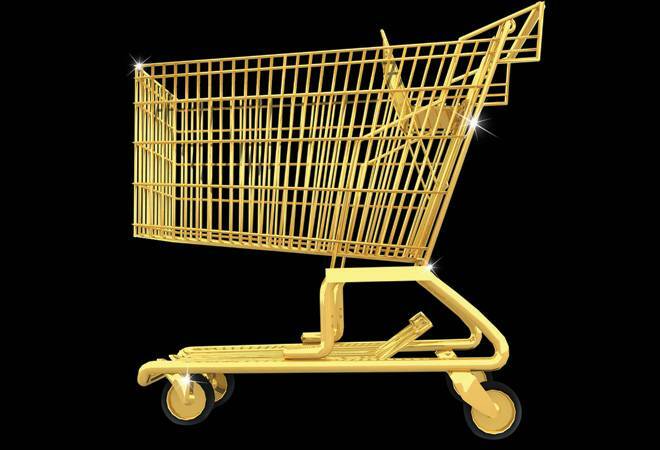 Weigh your options well just as you would check the metal's weight while buying.